AquaHIIT is an intense 45-minute, full-body workout. It blends on-deck and in-water exercises with both traditional and specialized equipment. Aquatic training boosts endurance and reduces impact on joints due to water’s buoyancy. Water also offers consistent resistance in every direction, making this class uniquely challenging and invigorating. Instructors are certified through Speedo Fit training courses. Goggles and aqua shoes recommended. Fitness punch card required. Fitness punch cards purchased at the Fitness & Recreation Center can be redeemed at the Grizzly Pool for this class, or patrons can purchase punch cards (1, 10, or 30 punches) at the Grizzly Pool that can only be redeemed for AquaHIIT classes. Register the day of the class on the online registration portal. This class is open to the public. 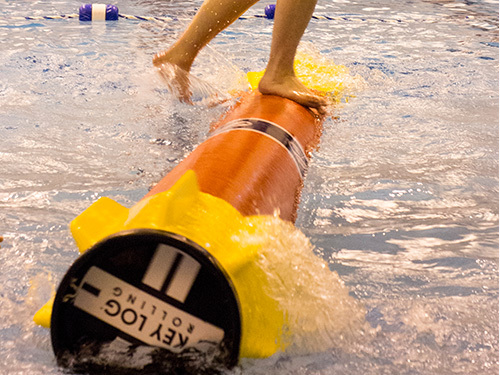 Key Log rolling is a fun workout now available during Rec Swim times at the Grizzly Pool. No experience necessary. The goal is to stay balanced on the log for as long as possible and keep your feet moving! Your core, agility, balance, and foot speed will be strengthened as you become more efficient on the log. For photos and more information about Key Log Rolling, check out this Kaimin article. 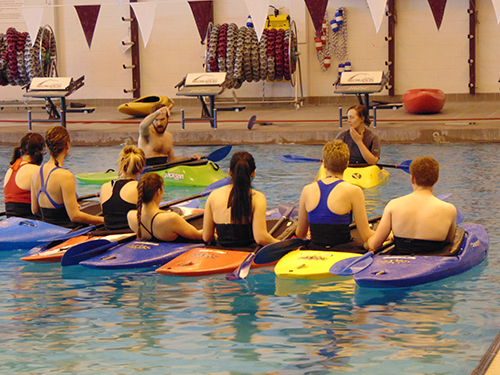 Sponsored and administered by the Campus Recreation Outdoor Program, instructional kayaking ranges from learning the fundamentals to perfecting your Eskimo Roll. Call the Outdoor Program at (406) 243-5172 and ask for dates and registration information.